If other users like the AccuBoost procedure, Heather Jones, MD. loves it – for the simple fact that she has spent more time than most exploring the benefits and side effects of the all-important boost component of whole breast radiation. 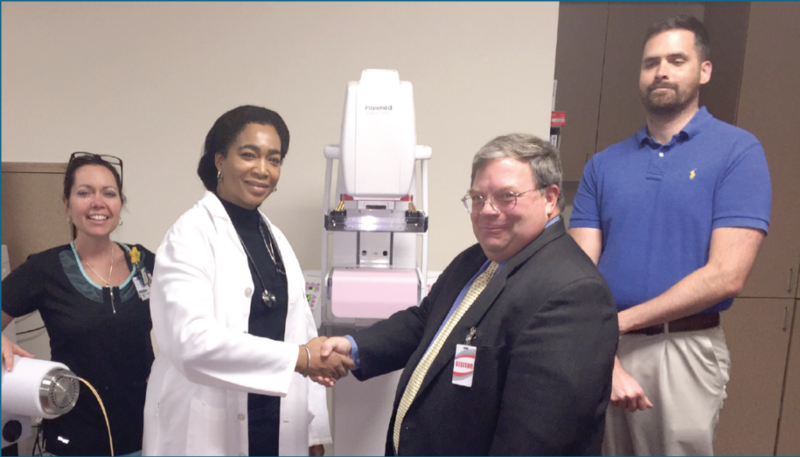 Dr. Jones is leading the AccuBoost effort at the Lake Wright Radiation Oncology facility in Norfolk, VA, one of the recent additions to the group of AccuBoost users. Lake Wright is a joint venture between the Sentara Group and the US Oncology Network, a part of McKesson Specialty Health. The AccuBoost offering at Lake Wright was launched in March. The launch schedule, which was initially arranged for two patients to receive AccuBoost prior to receiving the whole breast irradiation (WBI) had to be modified. When word spread among the patients in the waiting room, others that were nearing the completion of WBI showed interest and started asking if they could also qualify for the new treatment modality. As a result two additional women, a total of four, were treated during the launch. “I was pleased by the positive embrace of AccuBoost by patients and pleasantly surprised how well my post-WBI patient tolerated the procedure” Heather Jones states. Dr. Michael Kerley is a familiar name when it comes to AccuBoost. As a former Medical Director at Texas Oncology, he was one of the earliest AccuBoost adopters, having offered the procedure while at Paris, TX prior to his new arrival at Cancer Centers of Southwest Oklahoma. Cancer Specialists of North Florida (CSNF) is the most recent addition to the list of AccuBoost users. This group is the largest cancer care provider in Jacksonville, with an integrated approach for every aspect of cancer care. CSNF operates a dozen facilities in the greater Jacksonville area. The effort at this site is headed by Dr. Waseet Vance, radiation oncology medical director. In delivering the AccuBoost service, Dr. Vance is assisted by other radiation oncologists: Jessica Bahari-Kashani (who is an AccuBoost veteran), Christine Bo Bang and Emily Tanzler.